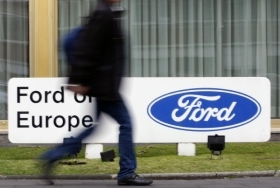 Ford expects its European market share this year to equal 2009. MUNICH – Ford Motor Co. swung to a profit in Europe in the fourth quarter of 2009 while its Swedish Volvo unit reported a much lower loss compared with the year before. The U.S. automaker reported a pre-tax operating profit of $305 million for Ford of Europe, compared with a loss of $338 million in the same period the year before when the full effect of the economic crisis was hitting auto sales. Ford said the improvement was explained mainly by lower material costs, higher volumes, favorable net pricing and structural cost reductions. But the company also said the result was hit by unfavorable product mix as Europeans increasing turn buying smaller cars that generate lower margins. Ford said fourth-quarter revenue in Europe was $8.7 billion, up from $7.6 billion a year ago. Ford's new-car sales in its 51 European markets including Russia fell 7 percent to 1.66 million in 2009. Ford said it expects its Europe market share this year to be about equal to 2009. The carmaker had a 9.1 percent market share in its 19 main European markets last year. Ford's Volvo reduced its fourth-quarter pre-tax operating loss to $32 million, compared with a loss of $736 million in the same period of 2008. The improvement is explained primarily by structural cost reductions, higher volume and mix, favorable net pricing, and lower material costs, offset partially by unfavorable exchange rates. Volvo's fourth-quarter revenue was $3.9 billion, up from $3.3 billion a year ago.